Here are the basics for finding your position using only the noonsite and how to to use the tables you can print from our on-line site. This page assumes you have some basic understanding of calibrating a sextant and taking sites. If not, try reading this short primer about sextants then come back to this page to learn how to do quick noon sites without the Nautical Almanac. A watch that is accurate to the seconds of the universal GMT clock or a radio capable of picking up the time signal. A way to measure the angle between the horizon and the sun. A sextant is ideal, but there are other improvised ways. See the "Emergency Navigation" on the previous page. less than 10°). To print out your own correction tables click here. Declination of the Sun (DEC) at the time of meridian passage. 2007 data, or 2008 data. Using your sextant at about 11:30am local time, start measuring the angle between the bottom edge of the sun (called the lower limb) and the horizon. Note the time in minutes and the angle of observation. Keep repeating this step until the angle reaches its biggest value and starts to decrease for about 30 more minutes. Using your information, you can make a plot of the sun's altitude versus time as shown in the following figure from American Practical Navigator. To find the time of your local apparent noon (LAN), you can average the times where the sun is at the same height on the ascending and descending sides. Thus the first average is Ta=(t1+t7)/2, then Tb=(t2+t5)/2 and Tc=(t3+t4)/2. 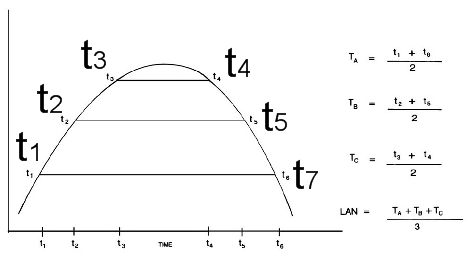 The total average becomes LAN = (Ta+Tb+Tc)/3. After you've done a bunch of noonsites, you'll get pretty good at gauging the time of noonsite without all this extra work. You can also cheat a little by looking at the time of meridian passage at GMT and start taking sights about 15 minutes before your estimated LAN. Now the fun part! Using the time of your noonsite (LAN), we can calculate your longitude and using the angle you measured at noon (Hs or Sextant Altitude), we can find the latitude. From the tables, look up the time of the Meridian Passage (MP or Mer. Pass.). Take the difference in time of your local time in GMT (Local Hour Angle) LHA minus MP. Next, convert the time difference into arc by remembering Hours*15 = degrees, Minutes/4 = degrees (convert reminder to seconds), Seconds/4= minutes. The result is your Longitude. For additional accuracy, add the Equation of Time (EoT) correction. Take your observed altitude, Hs, and correct for dip, refraction, parallax, and any sextant errors. This yields H, which we need to correct for the sun. Look up the sun's semi-diameter (SD) correction (for Lower Limb) for your date and add that correction as well. This is Ho, the corrected altitude. Take 90° - Ho to compute the zenith distance (Zd). If the sun is to your North, call your zenith distance South. If the sun is to your South, call the zenith distance North. Look up the sun's declination (DEC). If the DEC and the Zd (from Step 3) have the same N or S direction, add the two angles. If they are the opposite, subtract the smaller angle from the larger, and take the N or S label from the larger angle. This result is your latitude! After careful observation on November 27, 2004 the LAN was measured 33°28.7' to the South and occurred at 14h 11m 30s GMT. Eye height 10 ft, Sextant errors = 0. According to the tables (see excerpt below), MP is 1147.45 GMT. 180+45 = 225 seconds (next divide by 4 to get back to minutes of arc). This result is your Longitude. Note that it is West because your local apparent noon (LAN) is later than noon at MP. Also keep in mind if you are on the other side of the International Date line to make sure you look up the correct day for GMT noon. Take Hs = 33°28.7', (from the tables) correct for dip (eye height) = -3.1', refraction = -1.4' and parallax = 0.12, sextant errors =0. H = Hs - 3.1' - 1.4' + 0.12 = 33°24.3' (note we are working in degrees, minutes and fraction of minutes only). DEC and Zd have the same direction, so subtract them. 56°20.5' - 21°14.2' = 35°06.3'. Since the North measurement is the larger number, the latitude is N 35°06.3'.